OTTAWA – Federal police and border services are receiving $86 million to help crack down on gun crimes and illegal firearms entering Canada over the next five years. Public Safety Minister Ralph Goodale and Border Security and Organized Crime Reduction Minister Bill Blair announced the new funding as part of their pledge to crack down on illegal firearms and gang violence. The announcement was made as news was breaking in the United States of yet another mass shooting, this time in Los Angeles. 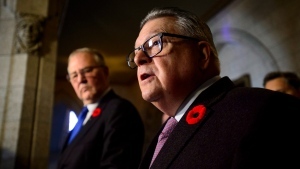 "It's crucial that they have the very best tools and training available to interrupt the flow of smuggled and trafficked firearms," Goodale told reporters in the House of Commons foyer Thursday morning. "Too many young people are lured into gangs with dangerous and tragic consequences. Too often innocent people get caught in the crossfire. No one should have to live in fear of gun and gang violence and no-one should feel they have no choice but to join or to stay in a gang," he said. The remaining $34.5 million will go to the RCMP's "Integrated Criminal Firearms Initiative" that focuses on enhancing their intelligence, investigation, and technology capabilities. The money is part of the broader "Initiative to Take Action Against Gun and Gang Violence" unveiled by Goodale last year. The money comes as part of the already-announced $327.6 million to be spent by 2022. More than $200 million of this is being doled out to the provinces and territories to address regional gun and gang issues. Asked if Canada is headed down a path towards American-levels of mass gun violence, and whether these millions of dollars would help make sure we don't, Blair said that "in many ways we are a fundamentally different country." "We have a very different culture with respect to firearms. We have a higher expectation frankly among Canadians about keeping our communities safe… Having said that what we are seeing an increase in gun violence across our country, a greater influence," Blair said. According to Public Safety Canada, the rate of violent firearm offences in 2017 increased for the third year in a row, up seven per cent from 2016 with 2,734 reported incidents. "Ultimately our goal is the reduction in the criminal use of firearms," Blair said. Conservative Leader Andrew Scheer slammed the Liberals’ guns and gangs plan, claiming the government’s most recent crime legislation, Bill C-75, makes the situation “worse” by “softening” Canada’s approach to gang violence. 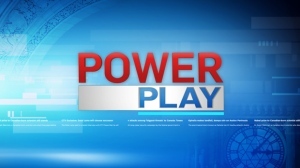 Instead, Scheer opted to introduce his own plan – the first of a promised three-pillar public safety plan and an early glimpse into the Tory election platform. Scheer’s plan has five proposals, including ending automatic bail and revoking parole for gang members. It would also create sentences for ordering gang crime, toughen existing sentences for violent gang crimes and identify specific gangs in the Criminal Code. The Conservative leader also said he would work alongside all levels of government to increase programs that can help people turn away from crime and reduce recidivism. “It’s lazy government to ask law abiding people to follow more laws. It’s harder, more challenging, to get real criminals off the street,” Scheer said.